During the last phase of military construction during the colonial era, these 23 vaults and 47 porticos were built into the 15 metre thick walls of the city. Finished in 1796, they were initially used as storerooms and later turned into a jail. If this historical tidbit is not enough to for you to visit them, then you might as well go for the excellent tourist and crafts shops inside each of the vaults today. After you are finished with shopping, you will find on the right side of the structure a flight stairs that leads to the roof. This broad expanse has a lovely view of the Caribbean Sea. Take your photographs. This is the best place in the city to pick up a souvenir. Shops are usually open from 10am-6pm. A lot of stores roughly the same items they sell. Therefore if can always walk down and most likely find it at another. Now some stores have unique jewelry which you can't find at other stores. Always room for bargaining. 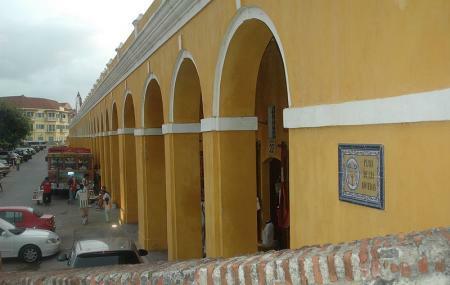 Most of the store owners are local meaning from Cartagena so feel free to ask them about places to visit. One provided me great locations for food and sights. This place is pretty cool. You've gotta wander through some kitschy merchandise but a few of the shops had some really cool items. One shop in particular, about the 3rd or 4th from the end, had a very helpful young lady with some great handmade and very authentic looking souvenirs. The deeper into the stalls, the better the items. Go exploring. Quaint local style market, set in old cave style jail cells. Very safe and friendly area and some excellent art shops. Cons: tourist prices so don't expect any good bargains. The market is really neat, with the storefronts built into the old armory. Unfortunately, many of the restaurants sell the same cheap mass-produced trinkets. I wish there was more diversity, and more local hand-made fair. Got some really nice souvenirs for my nieces. Way better prices than any of the shops in town our at the airport. You can haggle the shops against each other and get the prices reduced.